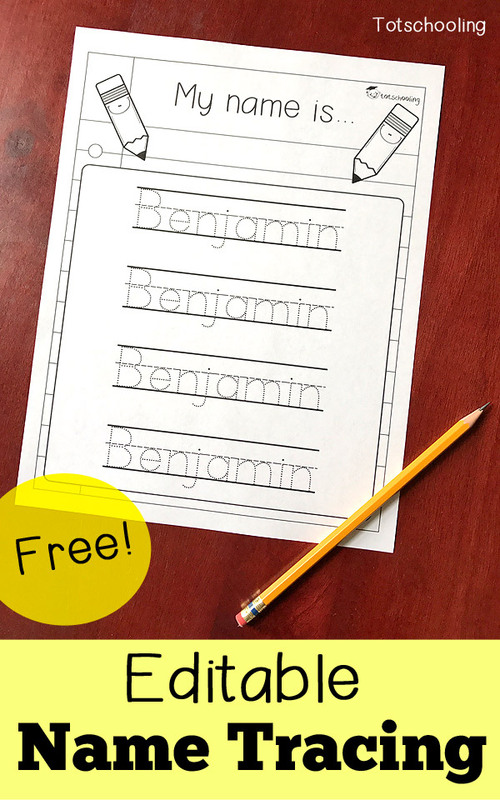 Use this FREE customizable worksheet for preschoolers and kindergarten kids to practice writing their name. 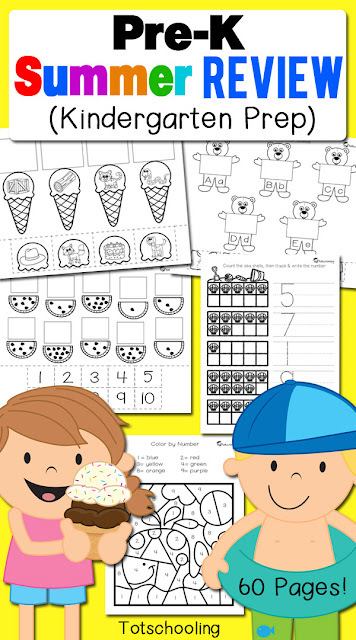 The file is editable so you can personalize it with your child or students' names. 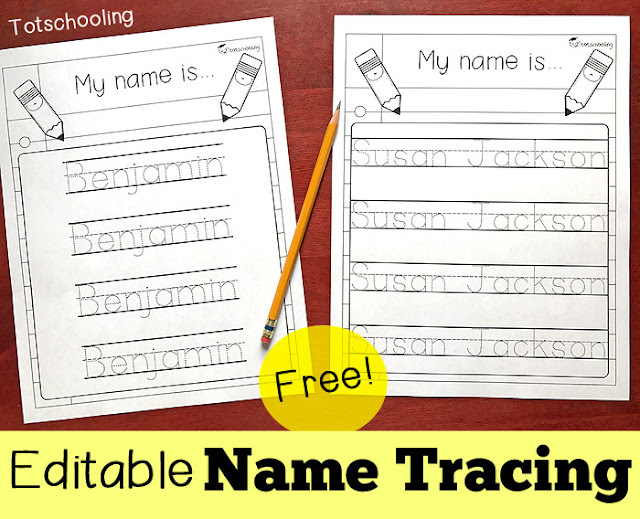 This FREE Name Tracing worksheet includes 4 lines for children to trace their name. For more advanced children, you can write their name twice on each line to trace it 8 times, or you can write their first and last names for them to practice. You will see the 4 highlighted fields that say "Name". Click on the top one and write the child's name, then press enter. You only have to type in the child's name ONCE, and it will change the remaining lines. I am not sure what I am doing wrong? When I type the name and hit enter, it erases all the writing lines and only shows the name in a very small font.? Hi, I am not sure what the problem would be. The fonts are embedded into the file. Do you have an older version of Adobe Reader maybe? No I shouldn't but I'll check and let you know. I just love all your stuff~~! I am trying this again, i did install the dot font and it's working but it is so small I can't figure out how to enlarge the font size. On my mac air on that screen does not have a text increase. So strange do you have any suggestions? Sorry, I'm not sure why it isn't working for you. It seems to be working fine for most people. I would suggest since you installed the font already, you can make your own sheets using a Word program on your computer. Just select the font and you can type the names. I had to fight with my computer, but in order for this to work with the font, you have to open the file with Adobe, not the computer default. I wasn't even realizing it was opening in something other than Adobe. - txs so much- its a great tool! Mine is doing the same as Poco's Cowgirl, I even tried re-installing Adobe Reader and it still doesn't work. Great, I'm so glad it works for you and that you find it useful! Thank-you this is a wonderful resource. Is there anyway that I can upload a different font? I have to teach using a pre-cursive font and I think it would be confusing if I gave them your sheets and then they had to learn a different style in their workbooks. Hi, Unfortunately you won't be able to change the font on this sheet. However, if you already have a font you'd like to use, you can create your own tracing sheet in a program such as Word. Select your font and then write the students' names. I hope this helps! Thank you SO much for sharing this incredible tool! I have been searching for the perfect name tracing document for five years - this is the one! Wow, that is so great to hear! I am so excited about this resource! Thank you so much for creating these. I make some each year, but they aren't this cute and are much harder to create. Thank you so much!! I'm so glad you like it and find it useful! I did install font but don't know why I couldn't change font in the file :( Can you show me how to make it works? Hi, Please make sure you are using Adobe Reader on your computer to open the file. You cannot change the font in the document but it should allow you to write the child's name. If you are still having problems, please email me at [email protected] and I can try to help. It must be a Mac issue, because I am also get a very tiny font. It could be a Mac issue, I'm not sure. I would suggest installing the font and making your own sheets in a Word program. Just select the font and type out the names. Hi, I installed your program but there was nothing in the Adobe file when it opened up after finishing downloading! Hi, I just want to verify that you clicked on the correct link. It is a red text link that says "Click Here to Download your Free Name Tracing Sheet". When you click on it you will see what the sheet looks like, but it won't be editable. Then, you will see a download button in the upper right corner which will save the PDF to your computer. Open the PDF from your computer and it will be editable. Is there anyway to have several different names on one sheet of the editable name tracing sheet? Hi, the way that the file is designed, it is made to repeat the same name. If you want to create your own I would suggest installing the font and making your own sheets in a Word program. Just select the font and type out the names. Thank you! This is perfect for my daughter! Unfortunately, I can not get it to work. As soon as I open the file it's straight lined instead of dotted. I already downloaded the dotted font & that did not seem to do anything either. I am trying and trying and it will not change font to primary dots! I am having the same problem as many people are having with the font being solid instead of dotted. I have had the KG dotted font in my computer for a while now. Same issue here, and I have used this file with no problem many times before. It is what we use in my prek classroom and I am currently unable to make a page for my new student. Hi, I am having trouble getting the file to open as well. I used this all last year with no trouble, but I'm noticing this year it's wanting to open in DROPBOX, not ADOBE. Any ideas to help would be greatly appreciated! For anyone having problems with editing: When the file opens into dropbox, this is not where you edit it. You have to download the file directly and then when it opens with Adobe (after clicking on the downloaded file at the bottom of the browser screen) you can click where it says "name" and delete and retype in the name of your choice. You're welcome. Hey guys! I finally figured this out! Hope my comment helps! This will open in DROPBOX. hit download when it does.